In the future, kidney care will become highly personalized and customized based on the genetic makeup and body tissue of each patient. Tissue will be used to grow a new kidney to replace a diseased one, such as in the case of polycystic kidney disease. Right now, rudimentary stem cells can be replicated, but in time, researchers will develop more complex, architecturally relevant models that are fully functional with a patient’s body, thereby eliminating the need for the immunosuppressive medication. Advances in stem cell-generated shunt technology hold the promise of organically compatible shunts for each dialysis patient, substantially decreasing the chance of rejection and other common complications. Virtual tissue technology has already identified two different types of cysts in PKD, which will help determine more specific drug targets moving forward. We are entering a new frontier in terms of genetic sequencing and the potential impact it holds on personalized health care. We don’t know what genes cause what diseases — yet. But in the next 10 years, more people will have their genomes sequenced, creating a data base from which researchers can determine genetic mutations and inheritance patterns. We’ll be able to sequence genes and medical histories in vitro, enabling us to spot potentially harmful mutations and devise more informed treatment protocols. People will sequence their genomes every several years so we can detect environmental influences that could lead to disease. We’ll even carry our genetic details on a USB or similar device that can be digitally accessed. Imagine that when you walk into a clinic, you have a health record that contains a full, detailed history of your health on a cellular level. Molecular blueprints will provide a remarkable amount of detail about our health and well-being with a baseline created in vitro. This will allow doctors to predict disease progression and treatment responsiveness. 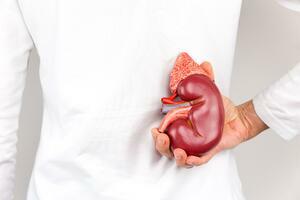 Kidney monitoring will be done regularly through urinary and serum biomarkers with treatments being adjusted due to changes in biomarkers and biometrics. Physicians will know how we genetically metabolize medications, reducing the chances of ineffective treatments. Advancing technology could render current dialysis technologies obsolete. Smaller, mobile technologies will provide temporary metabolic support. Devices will become wearable or take the form of artificial kidneys that automate metabolic functions. Patients will use mobile sensors that collect information on food intake and lifestyle habits, refining kidney function and treatment. Integrated use of 3D-printed tissue and smart materials will be able to replicate kidney design and function. While advances in dialysis are coming down the pipeline, you don’t have to wait to use technologies that provide more precise vascular access and monitoring, and immediately improve quality of care. Many of these predictions may sound like science fiction, but continuing research makes them exciting possibilities. We do know that the diagnosis and treatment of kidney disease will change tremendously in the next 10 years. The promise of a healthier, more autonomous life for our patients makes the future bright indeed.